Dr. Moshe Gai is a Professor at University of Connecticut, Avery Point, USA. He is also serving as Adjunct Professor of Physics, Yale. 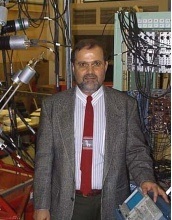 Dr. Moshe Gai is associated with American Physical Society, American Astronomical Society, Connecticut Academy of Arts and Sciences, New York Academy of the Arts and Sciences, Sigma Xi, Yale Chapter, Sigma Pi Sigma and UConn Chapter.